Contemporary industrial look perfect for lofts or downtown apartments. Full coverage flushmount fixture with classic knob and screw accents. Easy to replace bulbs or clean glass by unscrewing bottom finial cap. Use with (2) Medium, Type A, E-26 - E-27 bulb(s) - 60 watt max. Bulbs sold separately. This polished chrome contemporary semi-flush mount is a great addition to your entry ways and service areas. This is UL listed to be suitable for dry locations. The E26 bulb base gives you a very broad choice in bulb styles to choose from. 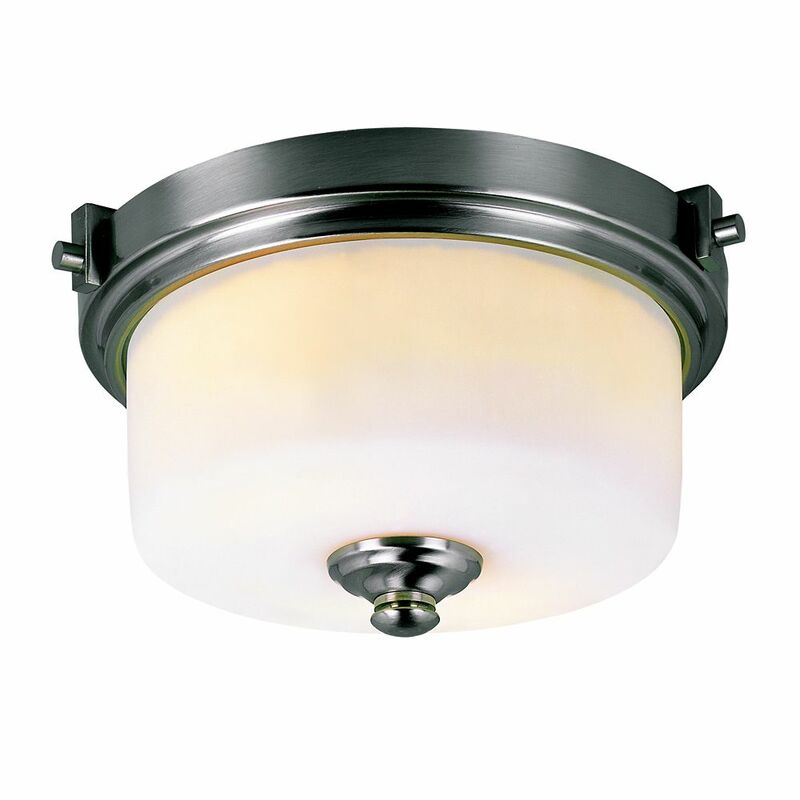 This brushed nickel contemporary semi-flush mount is a great addition to your entry ways and service areas. This is UL listed to be suitable for dry locations. The E26 bulb base gives you a very broad choice in bulb styles to choose from. Soft white glass shines from overhead for ambient light. Modern deco flush mount fixture uses clips to attach glass at frame. Suitable for damp locations. Perfect for bath, kitchen, and service porch areas. 13-inch Frosted Cylinder Flushmount in Brushed Nickel Contemporary industrial look perfect for lofts or downtown apartments. Full coverage flushmount fixture with classic knob and screw accents. Easy to replace bulbs or clean glass by unscrewing bottom finial cap. 13-inch Frosted Cylinder Flushmount in Brushed Nickel is rated 5.0 out of 5 by 1. Rated 5 out of 5 by GloriaJ from The fixture looks great in my bathroom. It goes very well with the vanity lights we chose from an... The fixture looks great in my bathroom. It goes very well with the vanity lights we chose from another manufacturer.